Kids have fun solving analogies because they are mental puzzles. In these printable Spanish analogies, they figure out the relationship between a pair of words and then choose another pair that is related in the same way. For an interesting discussion of using analogies in the classroom, read A Guide for Teaching with Analogies. Spanish analogies are a great language activity because the words are commonly associated with each other, for example sol-día, vaca-leche, zapato-pie. Thinking through the relationship reinforces the meaning of the vocabulary. Talking about Spanish analogies is also a good way to practice verbs. Frequently, the given words in simple analogies are nouns, and to explain the relationship you use a common verb. Kids can often solve an analogy even if they do not have the Spanish to express the relationship. 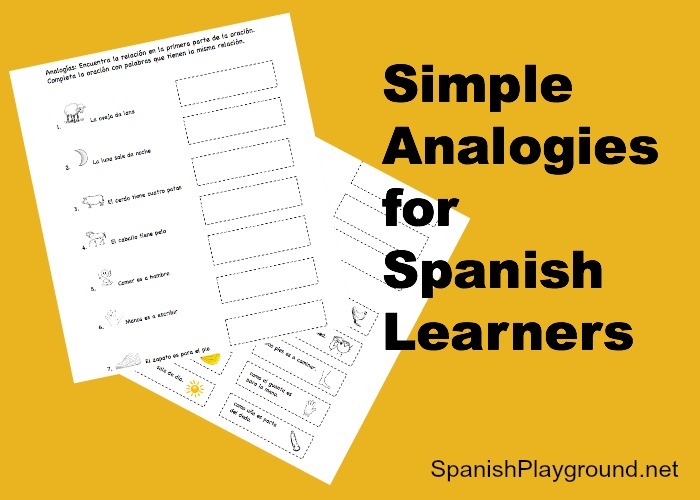 In this printable activity, both halves of the analogy are provided, and often the verb is included – La luna sale de noche como el sol sale de día. Other analogies use the “…is to…as…is to…” structure – Manos es a escribir como pies es a caminar. Teachers and parents can make the most of the activity by describing how the words are related so that kids can hear the verb – Usamos las manos para escribir. Usamos los pies para caminar. To do these Spanish analogies, kids cut out the second half of the analogy and glue it in the correct place to complete the sentence. There are pictures for key words on both halves, giving kids support to help figure out the relationship. La oveja da lana… como la abeja da miel. La luna sale de noche… como el sol sale de día. El cerdo tiene cuatro patas… como la paloma tiene dos patas. El caballo tiene pelo… como la gallina tiene plumas. Comer es a hambre… como beber es a sed. Manos es a escribir… como pies es a caminar. El zapato es para el pie… como el guante es para la mano. Oso es a cueva… como pájaro es a nido. Nariz es parte de la cara… como uña es parte del dedo. Verde es a hierba… como amarillo es a plátano. Do you use Spanish analogies in your classes? Please share the activities you like best! Very nice analogy explanation. I intend to use it when the students learn vocabulary related to animals and we study the cultural point of not using animal references to address people, unless the goal is to insult. Thank you for the tool! I’m glad you like the activity. In terms of animal references, there are some positive common comparisons: ágil como un gato, fuerte como un toro, etc. If someone fights off a thief, for example, “Es un león (una leona). I’m not sure how those fit into your content, but it is interesting!